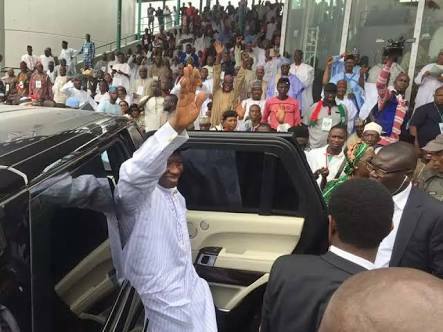 Exclusive : PDP Will Reclaim Its Prime Position In 2019 – Jonathan. • Makarfi prays for Buhari’s recovery. • Pictures from the convention. 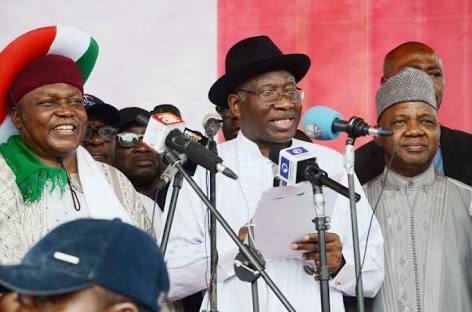 Former President Goodluck Jonathan on Saturday in Abuja announced that the Peoples Democratic Party had returned from limbo and would reclaim power in 2019. Jonathan asserted this in his address at the party’s a special national convention. He said that the party’s achievements while in power would rekindle the confidence of the electorate to vote it back in power in the 2019 general elections. “The party is indeed back to reclaim its prime position as the party to lead Nigeria to greatness. “As a human institution, we cannot claim to be perfect and as a political party, our accomplishments up to 2015 are clear for every Nigerian to see,’’ he said. According to Jonathan, the achievements of the party while in power are ample evidence to demonstrate that PDP is a party of vision and accomplishments. Highlighting achievements of the party, he said that elections conducted from 2011 by the government controlled by PDP met globally-accepted standard. “We succeeded in doing that because of the leverage and the autonomy we gave to the Independent National Electoral Commission (INEC). “PDP is a party that wants to place Nigeria in a position to compete favourably with other countries,’’ he said. On the economy, the former president said that PDP provided focused leadership through institutional and sectoral reforms which impacted positively on the country, especially in the last four years of our tenure. “We tamed inflation at a single digit, maintained price stability, and drove the economy to become the largest in Africa. “We also made Nigeria to be the number one foreign direct investment destination in the continent,’’ he said. According to him, in 2012, PDP ensured that prices of food remained stable in spite of flood which affected 50 per cent of farmlands along the flood plains of river Niger and Benue. Jonathan said that the country was able to regain its goodwill internationally because the PDP pursued programmes and policies that were not only rewarding but were copied by other countries across the globe. “We can recall that our agricultural transformation agenda transformed key agricultural value chains, boosted local production and created a new generation of young commercial farmers. “The introduction of electronic wallet checked corrupt practices in the distribution of fertilizer and enabled farmers to get fertilizer like all other agro inputs. “In the same vein, the YouWin programme empowered a crop of young Nigerians to go into entrepreneurship and in turn employed others,’’ he said. Jonathan said that though his administration did not block all the loopholes, it came up with strong innovations to fight corruption. According to him, we introduced the Bank Verification Number (BVN) and the Treasury Single Account (TSA) which has helped to reduce corruption. “Government is run by policies, the creative thinking, brains in the executive council and in the civil servants were harnessed to get to where we are. “If elected in 2019, PDP will fight poverty and ensure that food prices are reduced,’’ he added, and urged Nigerians to partner the party to restore good life in the country. Meanwhile senator Makarfi said it was the desire of the party that Buhari should be well soon. “We mean well for our president. We will continue to pray for him, we want him to be fit but that does not mean that we will go to sleep. We will work hard to win the 2019 elections,’’ he said. 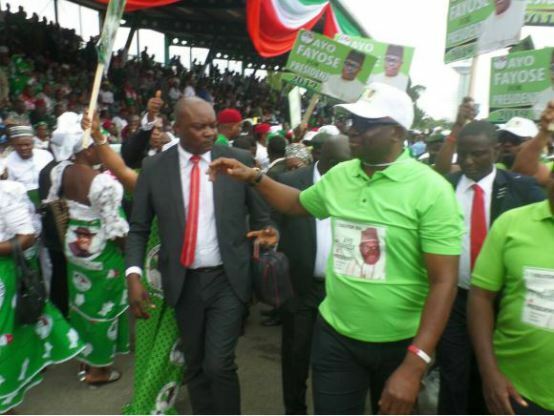 He described the non-elective convention of the party as an affirmation that the PDP was a government in waiting. 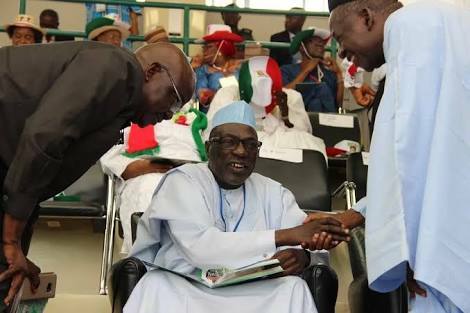 Makarfi commended the security agencies for ensuring that the convention was conducted in a secured environment. He also commended the Independent National Electoral Commission (INEC) for being unbiased and for demonstrating its independency. 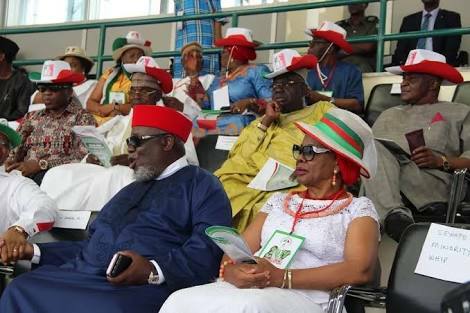 In his remark, Sen. Ben Obi, the Secretary of the PDP National Caretaker Committee, said all hands must be on deck to reposition the party to rescue Nigeria. Also, Mrs Iyabo Apampa, PDP stalwart from Ogun, expressed joy that PDP came back to life in spite several efforts to destabilise the party. Also the Party on Saturday extended the tenure of Sen. Ahmed Makarfi-led National Caretaker Committee by four months. The tenure extension is effective from Saturday which is one of the resolutions of the party at its Non-Elective National Convention held in Abuja. The caretaker committee was constituted on May 21, 2016 at the party’s National Convention in Port Harcourt, after the dissolution of the Sen. Ali Modu Sheriff-led National Working Committee. Its mandate was to organise an elective convention within 90 days, but the tenure was extended by 12 months in another convention in Port Harcourt on Aug. 17, 2016 following leadership crisis that engulfed the party. Minority Leader of the Senate, Sen. Godswill Akpabio, who moved the motion for the new extension, said that it would enable the committee to organise an elective convention that would produce elected national leaders of the party. The motion which was seconded by a former governor of Jigawa, Alhaji Sule Lamido, was unanimously adopted by the convention delegates. The delegates also ratified the dissolution of the factional executive committees of the party in Anambra, and authorised Makarfi’s committee to set up a caretaker committee in the state. The motion on the Anambra issue was moved by Gov. Nyesom Wike of Rivers, and in adopting it, the delegates mandated the national caretaker committee to organise congresses at all levels in the state as soon as possible. Also ratified at the convention was the dissolution of executive committees of the party in Adamawa, Borno, Kebbi, Ogun, Kwara, Osun and Lagos, and fresh congresses were ordered to be in the states within three months. The delegates agreed that the crises in the states should be resolved within the period but prior to the congresses. The convention also ratified and reaffirmed the election of the party’s executive committees in zones and states where congresses were successfully conducted. The motion on this was moved by Prof. Jerry Gana and supported by Chief Emeka Ihedioha, a former Deputy Speaker of the House of Representatives. Tribunal upholds Obaseki’s election as Edo governor.